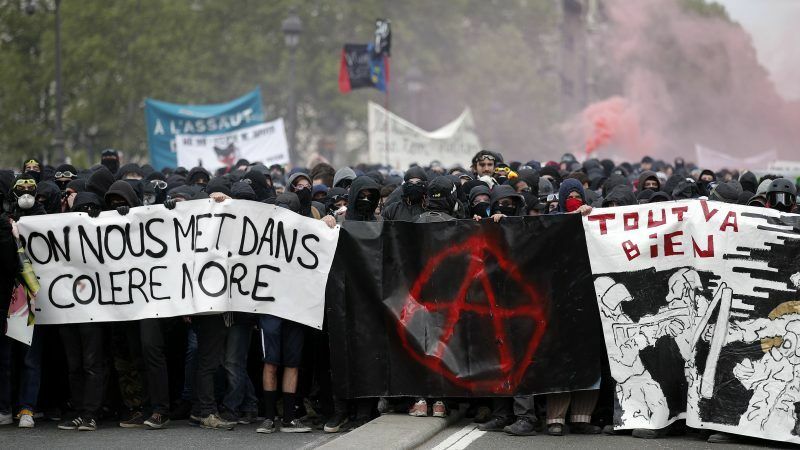 Hundreds of masked and hooded anarchists smashed shop windows, torched cars and hurled cobblestones at riot police yesterday, hijacking a May Day rally by labour unions against President Emmanuel Macron’s economic reforms. “They came to hit capitalist symbols and burn cops. When you come with Molotov cocktails, it’s to burn cops,” he said, citing clashes on 1 May last year in which one police officer was seriously burnt. #LCI#melenchon ridicule en accusant l'extréme droite ! sur toutes les images on voit des banderoles d'extréme gauche #Antifa, #BlackBloc #anarchistes et autres #zadistes !! !